Once named by the Hull Daily Mail as one of the city's living legends, Mick is also a member of rabble-rousing punk-folk band the Hillbilly Troupe, and runs the Hull & District Elderly Gentlemen's Binge-Drinking Club (Folk Section) every Wednesday afternoon in the Black Boy pub. 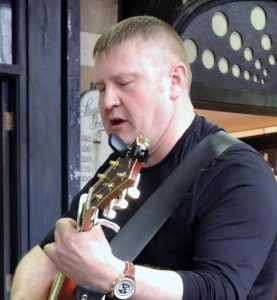 Bill’s been playing in folk bands since he was a lad, and was a regular member of the original Green Ginger Band and the highly acclaimed Yorkshire Garland Band among others. Bill sings, he is a multi-instrumentalist and is the group's musical director. Les has been involved in folk music for over 50 years, both singing and playing. He plays a Streb melodeon, bouzouki, harmonica and bass guitar, though not necessarily at the same time. The Streb melodeon is an electronic instrument, with sampled melodeon and concertina sounds that can be changed at the flick of a switch, as can the key played in. Other melodeon players consider this cheating. Steve is also a founder of Yorkshire Garland and one of the region's most extensive collectors of local folk song. Editor of 4 books of traditional folksongs, he specialises in the historical background to the songs. He plays anglo concertina and melodeon. Tom’s main interest is in Celtic music and he sings and plays a variety of high and low whistles. Like Mick and Les, he can also be found in the front room of the Black Boy of a Wednesday. Andy is the band's newest member. He sings and plays guitar and is a regular at the Minerva sessions as well as being involved in the Shanty Choir and Hull Folk Collective. If you'd like to book us or just ask us a question, please fill in the form on the right and we'll get back to you as soon as we can.